Quick Set Table is a Winner! 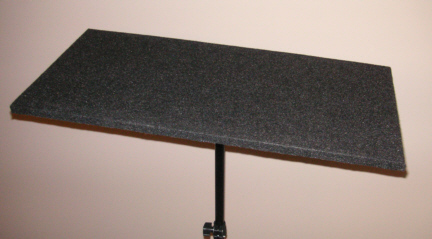 - The new fold up black powder coated stand is stronger, more stable and durable than older models. Looks more contemporary. Height adjustment is from 26.5 to 48 inches tall. 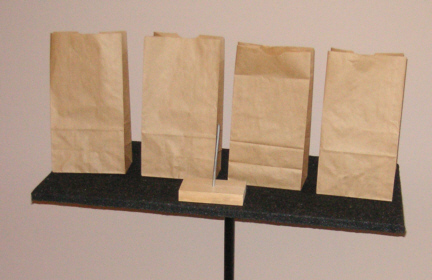 Making this a perfect table for Magicians. 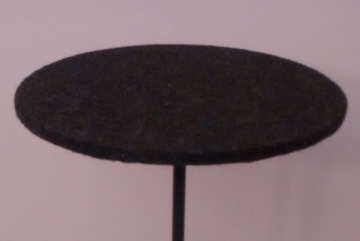 The table top measures 16 x 16 inches and is covered in black Ozite for long wear, Chrome colored Tee molding captivates the edge of the table giving it a professional finished look. TB54027 DELUXE SIDE TABLE - The perfect roll on side table! Lightweight, strong, and durable, sets up in moments. Table top is 18" x 24" covered with tough vinyl for long wear. 36" tall. Trimmed chrome "T" molding. Aluminum flange tightens with a thumb screw to the chrome column. The Column has a swaged bottom to snugly fit into the aluminum pedestal. Complete with hooded ball casters that are easily unscrewed if you so desire. Mint condition Showtime table with removable LED light inside. Includes cover and retractable handle. Hardly ever used. 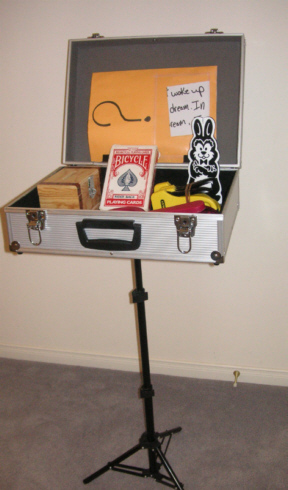 This high quality carry case table is a must for all magicians. 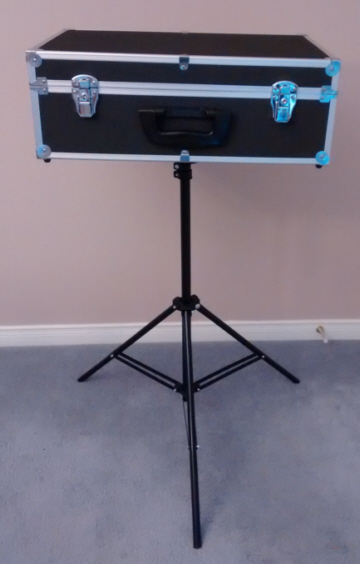 It is a carry case to put the props inside and also can be used as a close-up table. From a carry case to a magician's table, takes just 1 minute to prepare. Tripod legs screw in on the bottom of the case. (No hole in case). George Kimery from Chalet Magic custom made this table top for me. It's made of two 1/2" pieces of Baltic Birch plywood laminated to make a 1" thick table top. It has brushed aluminum trim around the edges held to the top with machine screws. 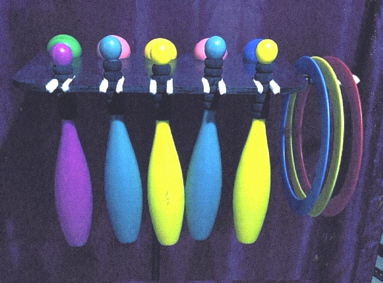 The aluminum flange was custom made by a machinist that George used to make these. It's fastened to the bottom side of the table with heavy bolts and is fastened to four "T nuts" sandwiched between the two pieces of plywood. George always pays a lot of attention to detail! The top is covered with black "Ozite" speaker covering and the bottom is covered with "Tuffcote" laminate. Everything is in like new condition. I trooped this top in an ATA shipping case all the time. It's in great shape. You'll have to get your own rolling caster base. 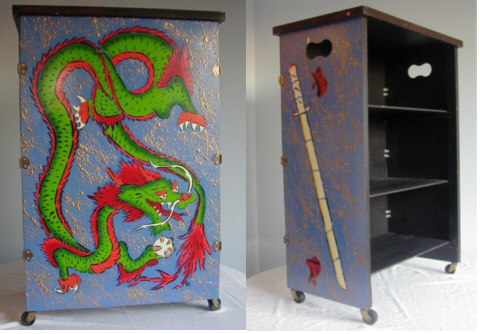 Magic rolling table with three shelves. Folds flat for easy transportation. TB53801 ROUND MAGICIANS TABLE - 14 INCH DIAMETER - Table is adjustable up to 86 cm (34 in.) Round table top is 14 in. diameter & 1/2" thick. Covered in carpeting for that pro look and no sliding of props. Tripod legs screw into the bottom of the table. Removable for transporting. Table top will fit a Eurecka base. Round table top is 31 cm x 1.5 cm (14 in. diameter x 1/2 in.) Table Top is covered in carpeting for that pro look and that your props do not slide. (Listing is for table top and flange only). Table top will fit on to a Urecka base. Rectangular table top is 31 cm x 61 cm x 1.5 cm (12 in. x 24 in. x 1/2 in.) Table Top is covered in carpeting for that pro look and that your props do not slide. (Listing is for table top and flange only). 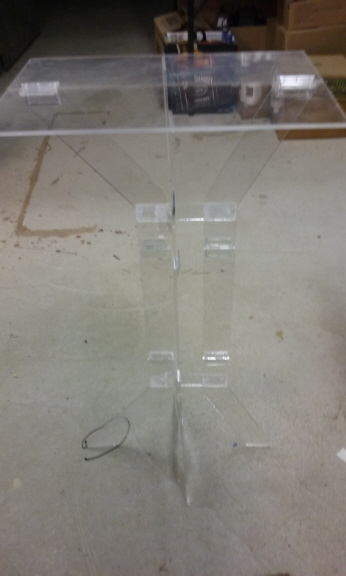 (PROPS NOT INCLUDED) Table top will fit on to a Urecka base. Table top is 31 cm x 31 cm x 1.5 cm (12 in. x 12 in. x 1/2 in.) Table Top is covered in carpeting for that pro look and that your props do not slide. 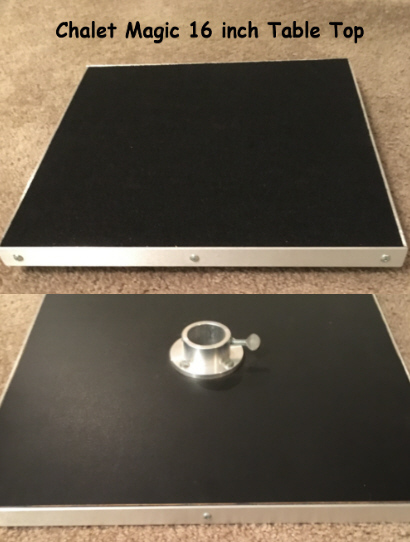 (Auction is for table top and flange only). Table top will fit on to a Urecka base. 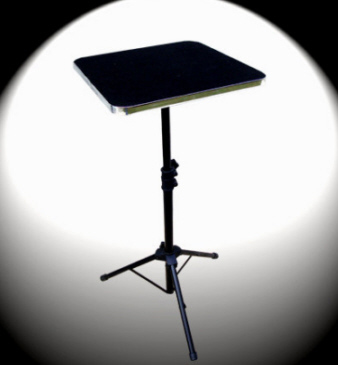 This high quality carry case table is a must for all magicians. It is a carry case to put the props inside and also can be used as a close-up table. From a carry case to a magician's table, takes just 1 minute to prepare. The tripod legs screw in on the bottom of the case. Covered in carpeting for that pro look and no sliding of props. Tripod legs screw into the bottom of the table. Removable/collapsible for transporting. 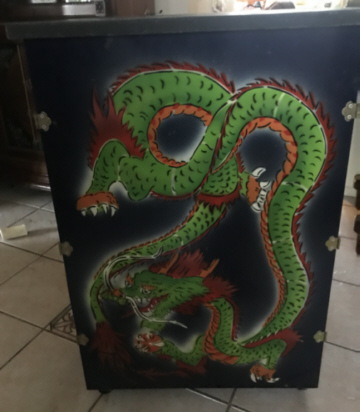 Dragon Motif Night Club Magic Table (Builder Unknown) Elegantly painted mystical dragon covers the surface of this magician's table. The table itself folds flat for easy load in and load out. Once unfolded, the table provides a presentation surface and three shelves for convenient & discrete storage of your show props. 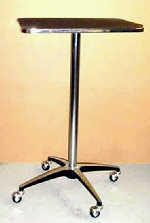 Table is built on four casters for easy mobility during presentations. Pick up available from Washington DC area. TB51683 DELUXE SIDE TABLE - The perfect roll on side table! Lightweight, strong, and durable, sets up in moments. Table top is 18" x 24" covered with tough vinyl for long wear. 36" tall. Trimmed chrome "T" molding. Aluminum flange tightens with a thumb screw to the chrome column. The Column has a swaged bottom to snugly fit into the aluminum pedestal. Complete with hooded ball casters that are easily unscrewed if you so desire. TB51208 LUCITE PRODUCTION TABLE - (works like a Harbin table) - This table works but needs some adjustment and care. If you have the handyman know how this is a great bargain. It opens up fine and all the hings work. How it turns to make it stand I don't know. There are some cords attached that do something but I don't know how to make it work. Will make a great prop for someone who knows about building magic. Made of high-quality, durable fabric and light-weight corrugated plastic this table weighs less than a gallon of milk and sets up in under a minute. But this isn't just another table. This Table has a shelf to hold props, an interchangeable front cover (or table skirt), and the bag it all stores in unrolls to reveal countless pockets, pouches, clips, and elastics to store and organize your entire show. 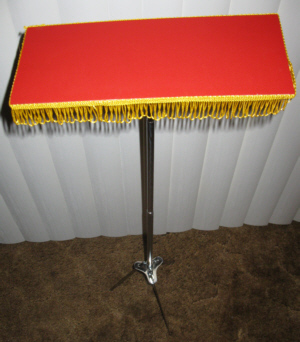 The Creative Magic Table comes with a wide variety of pockets designed specifically to hold many of the most common magic props PLUS they are adjustable. So if you want a deck of card near the top or a snowstorm to the side, you got it! You decide not only what pockets you want to use and where they should go. DELUXE SIDE TABLE - The perfect roll on side table! Lightweight, strong, and durable, sets up in moments. Table top is 18" x 24" covered with tough vinyl for long wear. 36" tall. Trimmed chrome "T" molding. Aluminum flange tightens with a thumb screw to the chrome column. The Column has a swaged bottom to snugly fit into the aluminum pedestal.